I almost gave up on Everything Here Is Beautiful by Mira T. Lee about 60 pages in. I didn’t, and I am glad. Everything Here Is Beautiful is about two Chinese-American sisters, Lucia and Miranda, who were very close growing up. As a young adult, Lucia – the younger of the two – experiences her first schizophrenic episode, and although she eventually gets better, the spectre of her hospitalization and the disease’s looming presence forever change the sisters’ relationship. Miranda is Lucia’s protector, always worrying about her and ensuring that she is stable, while Lucia braces against Miranda’s watchful eye and everpresent concern. 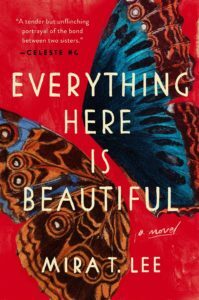 When Everything Here Is Beautiful opens, Lucia has impulsively married an older man, and Miranda is trying to keep up and accept it. For many months, things go well, but when Lucia’s illness resurfaces and her new husband is at a loss for what to do, Miranda steps back in to have Lucia hospitalized again. From there, Lucia’s life takes a number of turns that lead her from New York to Ecuador and back, while Miranda marries and moves to Switzerland. Their relationship, while strained and often dormant, remains an important guiding force for each of them, especially during the times when Lucia’s illness re-emerges. Everything Here Is Beautiful is a sad book. The epicenter of the pain – Lucia’s schizophrenia – causes ripple effects for her sister, her husband and her daughter. They all live in fear of her next episode, and the illness binds them all together as an involuntary support team for Lucia, who is not always receptive to their intervention. Mental illness is never cured; it’s just a question of which stage of the disease the afflicted is in – recovery, dormancy or decline. So why did I almost give up on it? It got off to a slow start, and I did it on audio at first, which didn’t work for me at all. There are three narrators – Miranda, Lucia and Lucia’s husband Manny. The narration of Miranda was OK, but Lucia’s voice was chirpy, upbeat and girly, which I didn’t find to match the character at all. Manny, too, came across as unemotional and rehearsed. It wasn’t until I switched to print that I could actually focus on the book and get into the story. In the end, I didn’t love Everything Here Is Beautiful as much as most people seem to have, but I came to appreciate it. And I think this book will have staying power. Posted on August 6, 2018 by gayle. This entry was posted in Fiction and tagged everything here is beautiful, mira t lee. Bookmark the permalink. I understand ambivalence about this book. I set it aside as well and even after finishing it I didn’t feel strongly enough one way or another to write a real review. I appreciate how you’ve framed this- about the impact of mental illness. So much of Miranda’s life is spent focused on her sister. It created such competing emotions. Interesting that you didn’t want to write a review. I feel that way too when I am ambivalent.